San Francisco is a city of animal lovers. It was one of the first cities in the nation, along with progressive bastions such as Boulder, Berkeley, and Amherst, to legally recast “pet owners” as “guardians.” Dogs now outnumber human children in the city. And it was the birthplace of the no-kill movement in animal shelters. It’s not surprising, therefore, that vegetarian eating is a big part of the city’s culture. Even fast food chains that cater to the Bay Area are starting to move in an animal-friendly direction. That is exactly what happened two weeks ago, when Chipotle announced the introduction of a vegan option. Chipotle, the third largest publicly traded restaurant company, has experienced explosive growth in recent years that outpaces even industry behemoths such as its former owner McDonald’s. Introduction of its vegan “sofritas” therefore portends a significant expansion in options for animal-friendly eating. So why are Bay Area animal rights activists protesting the chain? That is the issue taken up by a Salon article asked last week in a scathing review of the company’s marketing and practices. 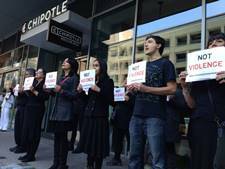 And, as a Bay Area organizer for the grassroots animal rights network Direct Action Everywhere, which is leading the international “It’s not Food, It’s Violence” campaign against Chipotle, it is a question that I am well-equipped to answer. Yet even meat industry publications have noted that the company sources from factory farms, where animals often go insane from confinement in dark, terrifying cages. The company uses marketing language – such as “natural” – that has no regulatory significance. And, as the pig farmer Bob Comis has pointed out, standard practices at even “humane farms” involve brutal mistreatment of animals. It is because of these discrepancies that consumer fraud attorneys, with no connection to the animal rights movement, have filed class action litigation to challenge Chipotle’s deceptive practices. But the problem with humane washing is even more fundamental than a mislabeled burrito. Because the basic question our campaign asks is not whether we have been duped by a single company… but, rather, whether we, as an animal loving society, have been duped by an entire industry that wants us to believe its violent lies. After all, even McDonald’s now trumpets its commitment to animal welfare. And nearly three out of four people believe that we should “eliminate all forms of animal cruelty.” But how can we say we love animals, and that we oppose cruelty against them, when we are cutting their throats (in necessarily violent and frightening fashion) for our financial or gustatory benefit? Chipotle’s fraud, in other words, is problematic, first and foremost, because it reinforces the violent lie that our dominant industries and culture are already telling us: that animals are merely things for us to (responsibly) use, kill, and eat. But, as the New York Times columnist and one-time food critic Frank Bruni recently discussed, there is increasing understanding, both morally and scientifically, that animals are beings who deserve the same respect and dignity we demand for ourselves. What is true of politicians is even more true of profit-seeking corporations, whether in housing, banking, or food. They do not have our movement’s agenda at heart. And, as Shaw points out, it takes pressure – not just praise – to ensure that progress is achieved and sustained. Moreover, corporations such as Chipotle, whose brand and profits are so heavily linked to progressive issues, are precisely the ones that should be pressured because they seek to appeal to (and therefore profit from) the progressive market. They, and not their more oblivious competitors, are the parties most likely to take action in response to pressure. In short, even supposing that some of Chipotle’s actions are indications of real progress, a strong campaign is the best way to ensure that those baby steps are sustained. The third and perhaps most important reason for our campaign against Chipotle, however, is that it presents an opportunity to create an empowered network against animal abuse. It takes on industry’s strongest argument, and one of its biggest and most popular players… with the confidence that it can win. This change in strategy – focusing on the industry’s strongest arguments and biggest players—is absolutely vital because, despite widespread sympathy for animals and compelling arguments by the most distinguished scholars of our age, the animal rights movement has made little progress in recent decades. Activists too often feel the need to appeal to flawed conventional wisdoms and accommodate to a false neutrality, even to achieve the most toothless reforms. In this regard, the animal rights movement is not unique. Paul Krugman has written for years about how conventional discourse on fiscal austerity has been deluded by popular acceptance that so-called “Very Serious People” (such as the deficit hawks of the Simpson-Bowles Commission) must have merit to their views—no matter the lack of evidence. Concerted action against climate change has been stalled by the public’s acceptance of false neutrality on the causes of climate change, and activists’ unwillingness to push back hard against this narrative. What these examples show us is that, to achieve success, social movements cannot concede to a problematic conventional wisdom; they must challenge it and attack the monolithic institutions that hold it up. The Very Serious People of the animal rights movement – even seemingly radical organizations such as PETA – believe that we cannot push the animals’ agenda with the strength, confidence, and honesty that the issue deserves. They believe that we have to compromise with conventional understandings of animals – and offer support for even the most deceptive and violent multinational corporations – in order to be heard. But, as with the debate on fiscal austerity and climate change, this is a false compromise that inhibits growth of a truly empowered network. Chipotle, in other words, is a platform for us to test, strengthen, and expand our movement’s message. When a movement is confident in the need for fundamental change, there is no need to apologize, or accommodate, or beg for the smallest of concessions from supposedly good corporations. Successful movements – such as Occupy Wall Street or the Arab Spring – assert themselves confidently even against the most powerful opponents. Animal lovers are, in fact, everywhere. The trick, as with so many other progressive issues, is to politically realize the public’s latent sympathy into an empowered network for change. And that is exactly what we plan to do with the “It’s not Food, It’s Violence” campaign – take on our most powerful and wealthy opponents, have confidence in the integrity of our message, and have faith that the arc of the moral universe will bend toward justice.